The West Tennessee Historical Society is the umbrella heritage organization for the Western Grand Division of Tennessee. Within its twenty-one counties, it supports historical programs, archives, publications, preservation, markers, museums, and other historical collections. Thus, the society promotes all aspects of state and local history. For information concerning membership, publications, WTHS Papers, annual awards, and resources, click on the appropriate menu item at the top of the page. News regarding monthly meetings and upcoming events, select WTHS Monthly Newsletter. West Tennessee Historical Society is a non-profit 501(c)(3) entity chartered under the laws of the state of Tennessee. WTHS activities are free and open to the public. The WTHS does not discriminate in any aspect of membership or participation on the basis of race, gender, religion, ethnicity, or national origin. Since 1973, an award is presented by The West Tennessee Historical Society to the contributor of the article chosen by the Executive Committee as being the best of those printed in each number of The West Tennessee Historical Society Papers. Click Publications and Papers at the top of the page to view past winners and their contributions. The West Tennessee Historical Society, the Tennessee Historical Commission, and everyone interested in the field of historical study have suffered an irreparable loss in the death of the Reverend Marshall Wingfield, president of this society, on May 7, 1961. His manifold accomplishments, the wide range of his interests, his deep and abiding concern for his fellow men, called forth glowing tributes and reminiscent anecdotes from “all sorts and conditions of men”. In fact the “Parson” engaged in so many humanitarian activities that one wonders where he found the time to devote to what we believe to have been his major interest (except, of course, his interest in the Church and his ministry), namely his concern for the welfare of this society. 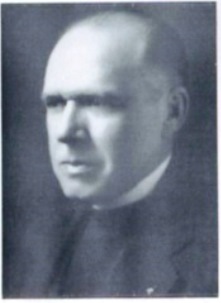 Dr. Wingfield came to Memphis in 1937 as minister of the First Congregational Church. He found the old Memphis Historical Society, recently (1935) transmuted into a West Tennessee Historical Society, in a moribund condition. He breathed new life and vigor into it, he extended its interests and activities to include the whole of the Western District, and was instrumental (with the help of the Tennessee Historical Commission, of which he soon became an active participant) in launching the publication of the Society’s Papers (1947). He contributed the first article to the first number, “Writers and Writings of West Tennessee”, in all provided four articles and edited two diaries for the Papers (see vols. I, III, IV, X, XIII). But this was only a small portion of his historical activity; for during the period of his presidency he wrote several books, was the driving force in securing speakers for our programs, articles for the journal, and able personnel for the Executive Committee and for the editorial board. He was instrumental in having the Society incorporated (1950) and in inaugurating peripatetic meetings which would serve to increase interest throughout West Tennessee. Thus he has served this society for twenty-two years, ably aided and abetted by his charming and efficient wife, Marie Gregson Wingfield. When he retired from the ministry in 1958, he realized that he was in poor health, and informed the Executive Committee that he planned to retire as President. Being persuaded by that committee to remain on, he remarked to them, in prophetic words, at the June meeting of 1960, “This is positively my last year”. Lack of space forbids the listing here of his many accomplishments, the many organizations to which he belonged, his varied education, his degrees and travel (historians are expected to know how to consult Who’s Who and other reference works). Of the fourteen volumes of Dr. Wingfield’s published work (sermons, poetry, history), four historical volumes remain in print: A history of Caroline County; Virginia (1924), Literary Memphis (1941), An Old Virginia Court (1948) and General A. P. Stewart (1954). As noted above, tributes from many diverse sources poured in at the time of his death; editorials, reviews of his career, reminiscences (e.g., Paul Flowers’ Greenhouse) etc. ; we should like to include them all, but will limit ourselves to two. First, some excerpts from a very eloquent tribute by a longtime friend, Rabbi James Wax, which was given by Dr. Wax over the radio station WMPS during what had been Dr. Wingfield’s hour; and in conclusion a brief “In Memory” poem by Paul Sawrie. Marshall Wingfield was an uncommon man, with a common touch. His earthly life was less than three score years and ten, but he accomplished so very much. It is difficult to comprehend his ministry. It was so broad and all-embracing. Within his life time, he served so many causes and he served them well. He was an historian and a scholar; a writer and a poet; a preacher and a prophet; a leader and a humanitarian. Whatever was human interested him. Whenever he could help – he helped. Whenever he could serve – he served. The greatness of Marshall Wingfield lies not only in the diversity of his many interests, but in the unity of his philosophy. Marshall Wingfield believed profoundly that all men were children of God – that every human being had within him a spark of divinity. Thus he sought consistently and ceaselessly to improve the conditions under which men live; that every person should achieve his highest potentialities and live with dignity. If there was injustice, he sought to remove it. If there was bigotry, he sought to blot it out. The voice of the oppressed, the downtrodden, the mistreated touched him deeply, and during the days of his years he battled wisely and fervently for justice, righteousness, and peace. …He was a man of vast knowledge, deep understanding, lofty principles and broad vision. We can truly say that the world is better because Marshall Wingfield lived in it … His prophetic voice has been stilled; his scholarly pen has been halted; but what he said and wrote will live on as a blessing and inspiration … We express our thanks to God for the life of Marshall Wingfield. We thank Him for his love and labors; may his soul be bound up in the bond of eternal life. As sun on winter’s snow.